Leaving the main road we pass the bus stop. Adorned with childrens characters it feels as if you are heading to a woodland camp. And that was the intention. The road is made of concrete slabs, still intact despite the extremes of weather they have endured over the last 40 years. Marked as a ‘children’s camp’ on maps it was a secret in plain sight. 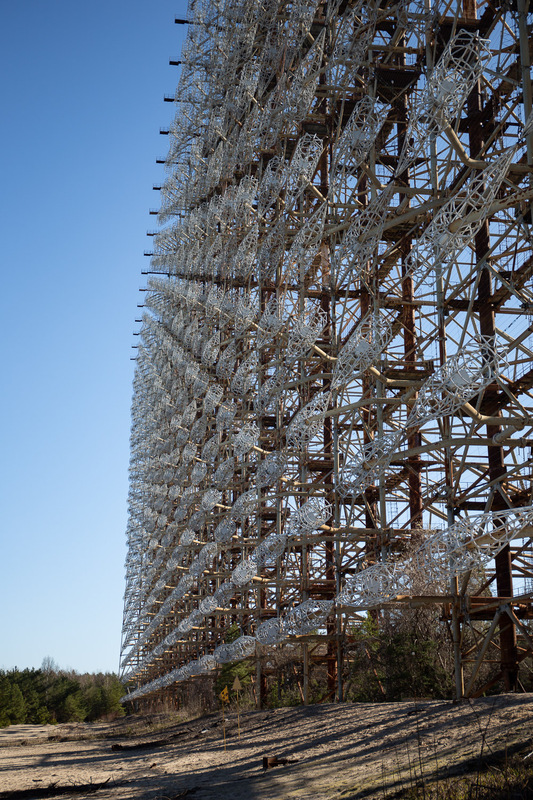 For many years the “Duga” Radar system near Chernobyl was visible on the horizon from the city of Pripyat, but no-one really knew much about it. Located in the middle of the forest, 7km from the main road this over the horizon radar system sat and watched what the western world was doing. Two were in operation, this one near Chernobyl and a second in Siberia. Duga was designed to detect ballistic missiles heading from the north-west, from the Arctic and the Atlantic, the direction US missiles would come from. It was a huge steel structure and still feels huge as you stand in its shadow today. 150m high and 500m long, with the second antenna slightly smaller at 120m high and 250m long they are on a scale which is hard to comprehend. 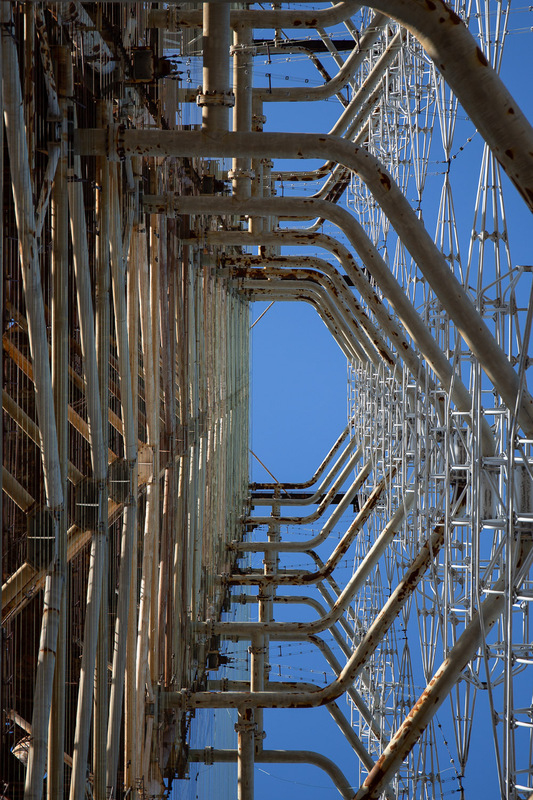 Lifts were installed in the legs to enable work to be carried out at the higher levels but these are now rusting and falling into the sandy land around the base of the structures. Audible on radio’s across Europe it was known as the “Russian Woodpecker”. Tapping annoyingly as it jumped around the frequencies used across the world. Gradually over time the tapping diminished until it stopped altogether at the end of the 1980’s as the threat of a Cold War diminished. The reason why may never be known, but it certainly wasn’t evacuated immediately after the Chernobyl disaster. 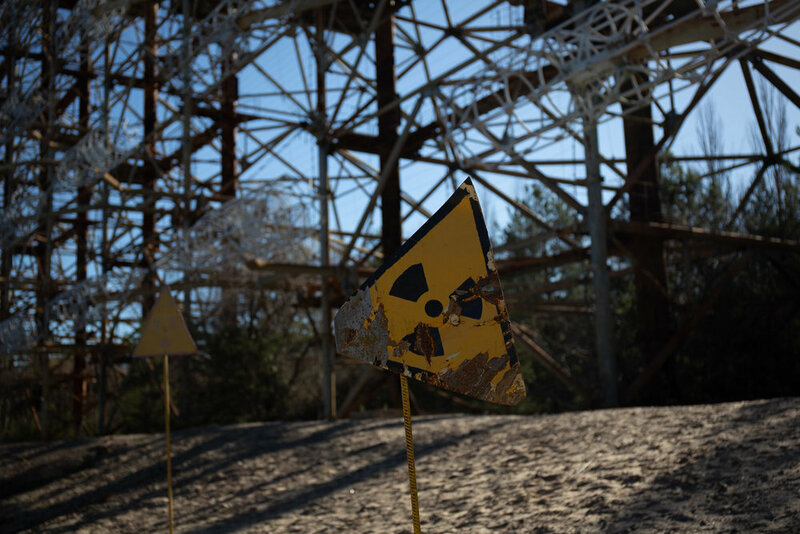 Adjacent to Duga is Chernobyl-2. This was a garrison town that housed the computer systems needed to run the radar as well as accommodate the 1500 personnel employed. There was extensive training carried out within the garrison with training rooms still evident today. The corridors are strewn with debris. All the computer systems have been removed but vast rooms remain with the racks where they would have once been. The training room contains paintings of the missiles used by foreign countries. Photographs were rare and so artwork was the only medium available. Walking through these now derelict buildings and silent pylons, the threat of the West can be felt. Huge amounts of money must have been spent on procuring the expertise and energy to design, construct and operate the site. Guided by Tarzan one of the resident street dogs this is a strange but mesmerising place.